Our program is free to join, it's easy to sign-up and requires no technical knowledge. Affiliate programs are common throughout the Internet and offer website owners an additional way to profit from their websites. Affiliates generate traffic and sales for commercial websites and in return receive a commission payment. Popular examples of referral programs include Amazon.com Office Depot, Ebay, and many more. NEW CLIENT CONTEST ! 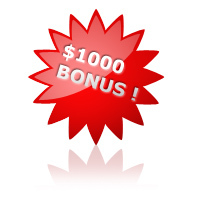 Send us 10 new clients between now and March 1st and we pay you $1000 bonus ! Commission Type Pay-Per-Sale Recurring 10% for each sale you deliver – Every Month for as long as the customer is a client. Initial Deposit $40.00 USD – Just for signing up! Payout Duration Payments are made once per month, on the 10th – for the previous month. SIGN UP NOW AND BEGIN MAKING $$ !!! When you sign up to be an affiliate, you get links and banners containing a special ID number unique to your account. This link and ID are attached to the checkout system, so if a person buys our encoder, or signs up for hosting service, if you referred that person you get a percentage of that sale! We even supply software for you to GIVE AWAY and you earn $$ when someone buys he full version of software or orders hosting. When a sale is registered from your referring URL – you get an automated email to inform you of the sale. Some of our affiliates make hundreds of $$ every month, building an extra income to use as they please !